Thank you for your 100+ votes on the baking poll! It was a real winner! 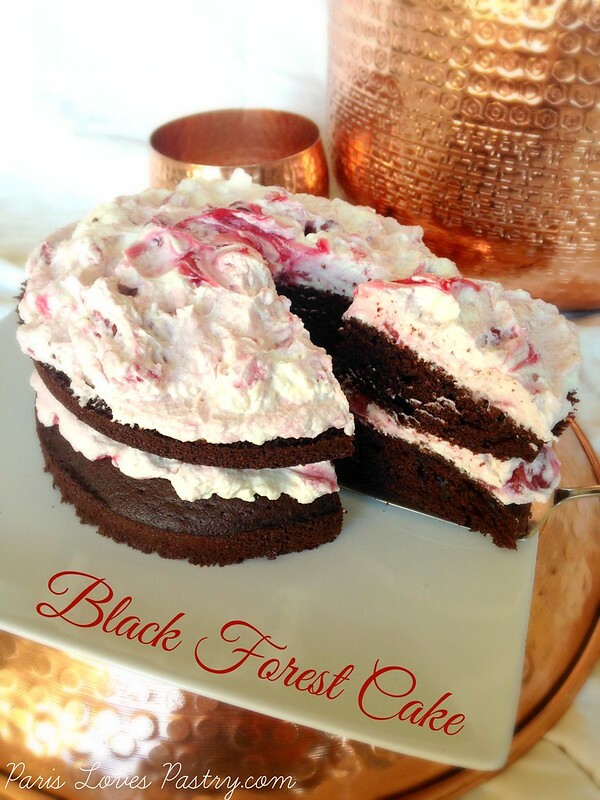 I can't understand why I haven't made a black forest cake sooner when I've had this blog for over 5 years. I mean, I live a 15 minute drive away from Germany, and chocolate cake & red fruits have been a favorite combination of mine for years. Well, I'm glad there are still things to "discover" in the baking world as I made my first schwarzwälder kirschtorte today! 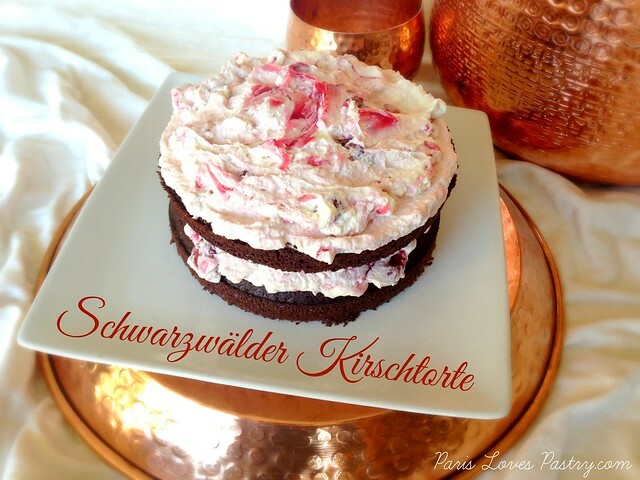 A true Schwarzwälder Kirschtorte would't be the same without kirsch liquor. Although I read a traditional black forest cake also uses black cherries. My cherry tree actually grows them, but it is not yet the season for cherries and I could wait to make it... but I find chocolate cakes more of a Winter treat. 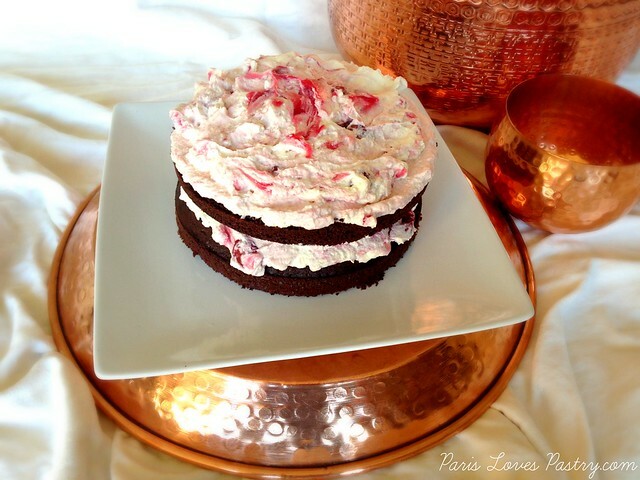 The recipe is from the Nutmeg Nanny, who says she made it her own interpretation of a black forest cake. So did I. 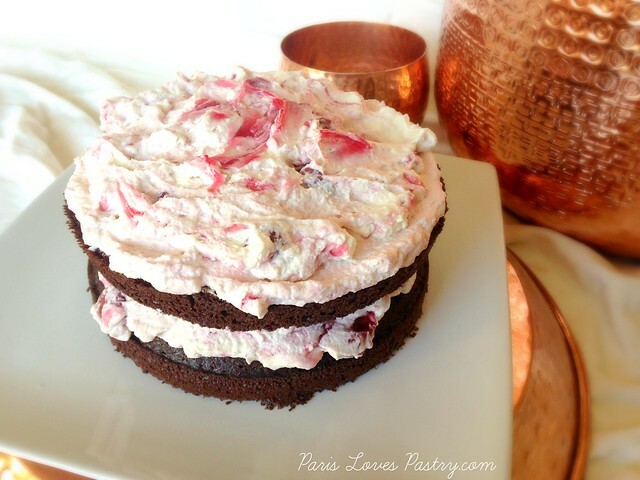 A rustic, luscious black forest cake. 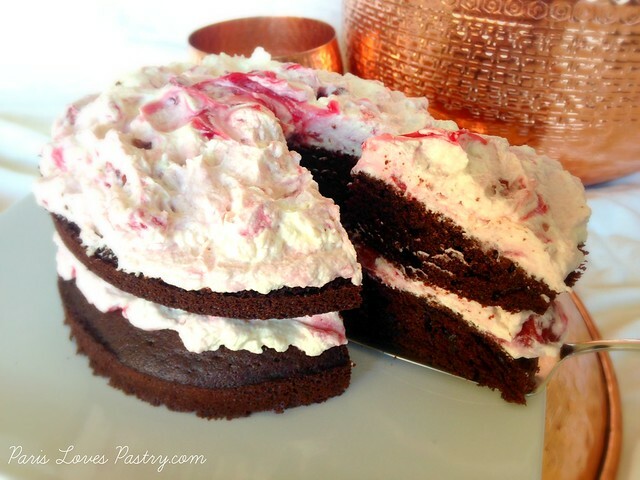 The rest of the cake consists of a moist dark chocolate cake and a mascarpone whipped cream filling to alternate with a cherry pie filling. Yes I said it. C-H-E-R-R-Y P-I-E F-I-L-L-I-N-G! Why not? The cherries and sauce get mixed together with a home-made whipped cream/mascarpone filling so you barely notice. The cake met my wishes and tasted absolutely incredible! I find that chocolate cakes sometimes even taste better the day after, if you can hold yourself together for that long. I can't, unfortunately. Rating 5- out of 5. - Preheat oven to 350°F, line the bottom 2 (9-inch) round cake pans with parchment paper and spray the pans with non-stick cooking or baking spray. - In the bowl of an electric mixer add flour, sugar, cocoa powder, baking soda and kosher salt. Whisk to combine. - In a medium sized mixing bowl add egg, egg white, buttermilk and vegetable oil. Whisk together until well combined. Drizzle in the coffee and brandy while whisking constantly so you do not scramble your eggs, about 2 minutes total. The batter will be runny. - Divide the batter into the prepared pans and bake for about 25 minutes or until a toothpick comes out clean when tested in the middle. Cool completely. - In a medium bowl, mix the cherrie pie filling together with the kirschwasser. - In the bowl of an electric mixer add heavy whipping cream and beat on high until soft peaks. - Add in mascarpone, powdered sugar and vanilla bean paste and whip until stiff peaks have formed. - Place one cake on the bottom of your cake stand or cake plate. Top with 1/2 of the mascarpone whipped topping and 1/2 of the cherry mixture. Top with remaining cake and spread remaining whipped topping on the top of the cake. Top the cake with the remaining cherries. And every time when i stop by you,it's Soooooo delish here.... and so invited to try a make something tasty! My sister brought me a can of cherry pie filling by mistake - something I would never buy. I have been wondering what to do with it. This looks like the cake to make. Black forest is the cake to make on all occasions, whether for Christmas or Easter or for a Sunday lunch. Every one enjoys it...Your chocolate cake looks absolutely divine, congratulations!